Happy Healthy Home: Berry French Toast Casserole + A Giveaway! I received various BFree Foods to review, however, all opinions are 100% my own. This giveaway is sponsored by BFree Foods. My favorite meal of the day has to be breakfast [aka, brunch]! I'm a smoothie loving, eggs and avocado gal during the week, but once the weekend rolls around I'm all about Paleo Pancakes and French Toast Casserole. 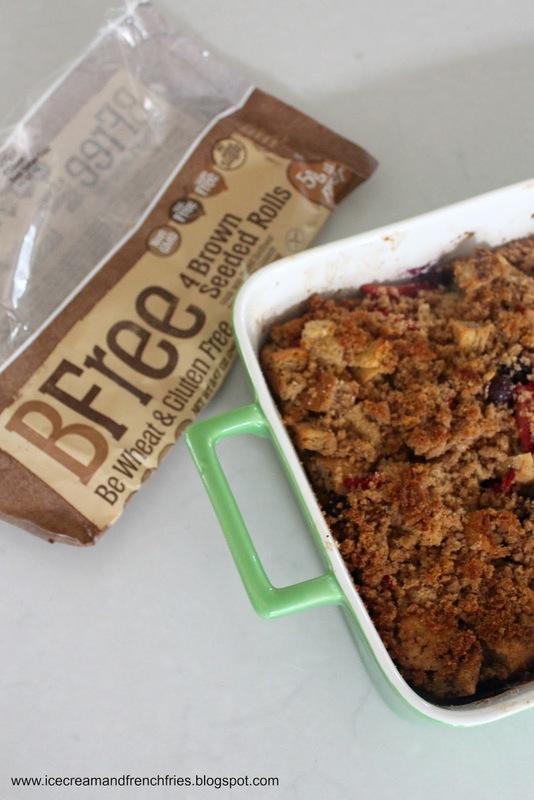 Recently BFree Foods hookup this blogger up with a serious package! I'm talking torialla wraps, rolls, bread and bagels. Guess what?! It's all dairy and gluten free! OK, I hope I didn't scare you away. I typically shy away from products that are "gluten free" because, well, they typically taste like cardboard. Not BeFree! BeFree will change you're mind about gluten and dairy free products. Pick up a loaf the next time you're at Raley's or find a store near you HERE. Over the last few weeks I've enjoyed BFree with various meals. For example - avocado toast, bagel with egg, BLT and most recently a french toast casserole! Overall, the products are pretty good. The Brown Seeded Sandwich Loaf is by far my favorite. It has a slightly different texture and is overall a tad dryer, but toasts well and tastes good. 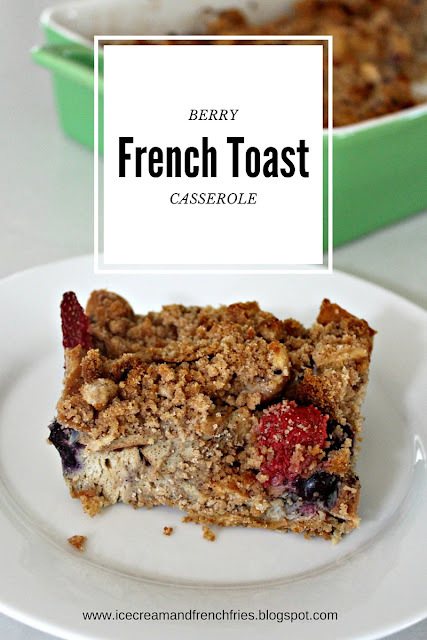 I was curious to see how the rolls would work in a casserole so I headed to the kitchen and made a Berry French Toast Casserole. Overall, I was impressed. The casserole turned out pretty darn good. What's you favorite indulgent breakfast? Do you make it DF/GF ? When ready to bake the casserole, preheat the oven to 350 degrees. Grease a 9 x 13 casserole pan. Tear bread into chunks, roughly 8 cups total. Spread half of the bread evenly in the bottom of the pan. Add about half of the blueberries and strawberries. Add remaining bread and top with remaining berries. Whisk together eggs, milk, sugar, vanilla and cinnamon. Pour evenly over bread, making sure to wet all bread pieces. If you're not ready to bake right away, cover and refrigerate for at least two hours, or overnight. For the crumb topping mix together flour, brown sugar and cinnamon. Add butter and mix into the dry mixture until it all comes together and is crumbly. 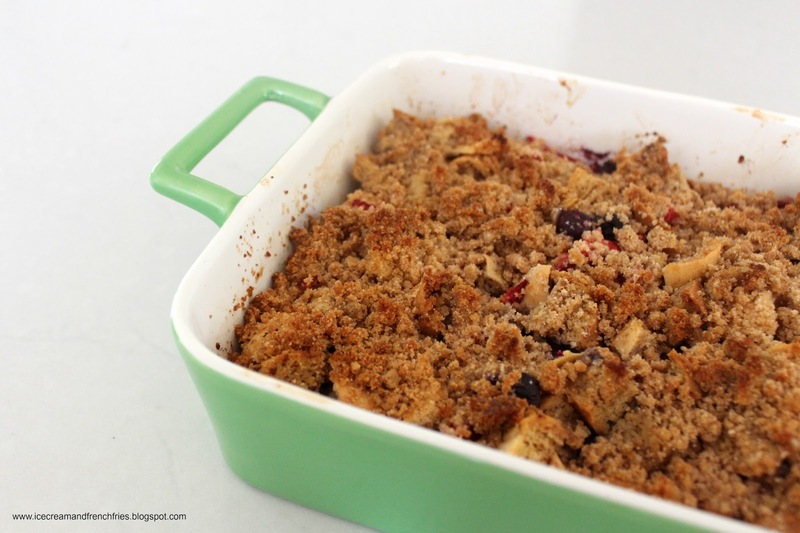 Sprinkle crumble topping evenly over casserole. Bake for 30-40 minutes. Pro tip: Sprinkle a little powdered sugar and serve with syrup. As part of my review, BeFree Foods is kindly offering one lucky reader a chance to win a care package of products from BFree Foods [one of each BFree products (6 total)] and a $25 gift card to Raley’s. Prize: (1) Care package of products from BFree Foods[one of each BFree products (6 total)]; (1) $25 gift card to Raley’s [for NV and NorCal entries]. I'd really like to try the Quinoa and Chia Seed Wraps with Teff and Flaxseeds. I live in Ohio and they are available at the store we shop at the most! I just read the rules and noticed there is a gift card as part of the giveaway and I would not be able to use it but the other portion of the prize pack sounds great! The quinoa and chia wraps look amazing! Breakfast is my favorite meal as well, followed closely by dessert! This french toast looks amazing! Omg this looks so yummy!!! Perfect for Sunday brunch! This reminds me of bread pudding!! It looks amzing! Who wouldn't want this for breakfast? Looks great, I want to try! But what I replace Soft White Rolls? Oh I would love to try their Soft White Rolls! They look so good! I have been looking for a roll for many years since my celiac disease diagnosis. I would love to try these. I am not in NV and NorCal for the giftcard though. Quinoa and Chia Seed Wrap with Teff and Flaxseeds! And I'm not in either of those states. i'd love to try the bagels! I would love to try the bagels or wraps or any of it! How yummy! 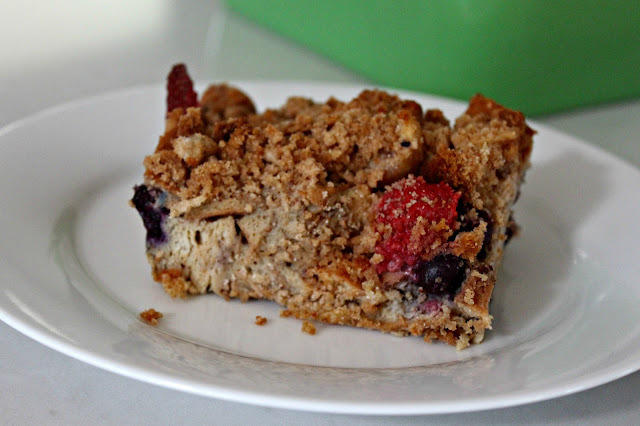 Pinned this delicious recipe as well! Definitely French toast! & no I live in ny!